Hon Hai Precision Industry, commonly known as Foxconn, was founded in 1974 by Terry Gou in Taiwan. Today, Foxconn manufactures more than forty percent of the world’s electronics and employs more than 1.2 million workers, most of them in mainland China. Hong Fu Jin Precision Industry, based in Shenzhen (immediately north of Hong Kong), is a subsidiary of Hon Hai Precision Industry, founded in 1998. It is Hong Fu Jin that manufactures my favorite Apple gadgets and many other products for multinational corporations. The company also manufactures an industrial robot, called the Foxbot, at its notorious Shenzhen mega-facility, which employs more than 230,000 workers. On July 30, 2011, Xinhua News, China’s state-controlled news agency, reported that Terry Gou, then chairman of Foxconn, was claiming that his company would replace some of its workers with 1 million robots in three years to cut rising labor costs and improve efficiency. At the time of the announcement, Foxconn had allegedly manufactured 10,000 robots already, was set to increase that number to 300,000 in 2012, and planned to produce 1 million by 2014! 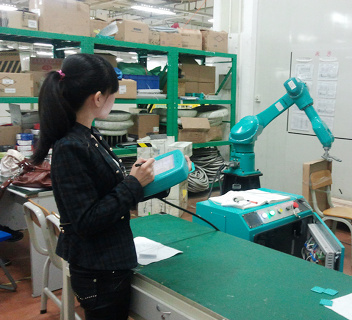 The Automation Robotics (AR) Division of Hong Fu Jin Precision Industry (more accurately, of the Super Precision Mechanical Business Group, SHZBG) was established in January 2007 in Shenzhen. This division is headed by Dr. Chia-Peng Day, vice president of Foxconn, who obtained his Ph.D. from MIT in 1978. In the late 1980s, Dr. Day was specializing in robot calibration and working for GMF Robotics (in the USA). Foxconn manufactured its first industrial robot at about the same time it secured its first contract to build Apple’s iPhone (a coincidence?). The first Foxbot was demonstrated to the public in October, 2006. As of March, 2008, Foxconn’s offering of industrial robots included two small six-axis 5 kg payload serial robots, one medium-sized 16 kg payload serial robot, and one SCARA robot, according to their 2008 brochure. 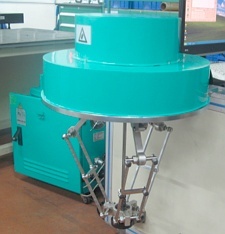 By the end of 2009, the company had developed three small six-axis 5 kg payload serial robots, two medium-sized serial robots (16 kg and 20 kg payload), one four-axis palletization serial robot with only a 5 kg payload, four Cartesian serial robots, three SCARA robots with 5 kg payload, and one mini Delta parallel robot with 0.5 kg payload, according to one of their presentation documents. The price of a Foxbot is said to be between $20,000 and $25,000, which is about 50% less than that of other brands of industrial robots. 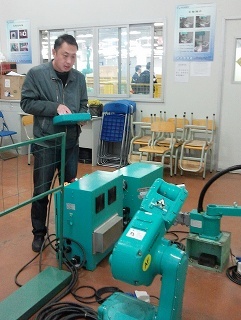 So far, Hon Fu Jin Precision Industry has been granted several dozen industrial robot-related US utility patents, one for a SCARA robot (US8201472), one for a cylindrical robot (US8240973), one for a Delta robot (US8210068), and one for a two-legged Delta robot (US8272290). The company has also applied for US utility patents for a typical hexapod (US20120103128), a linear-drive two-legged Delta robot (US20110154936), four typical six-axis serial industrial robots (US20110303042, US20110113916, US20110106302, US20110126661), and a typical four-axis serial industrial robot (US20120067156), as well as for a copy (US20120079908) of Adept Technology’s Quattro parallel robot invented by Prof. François Pierrot and his team (US7735390). 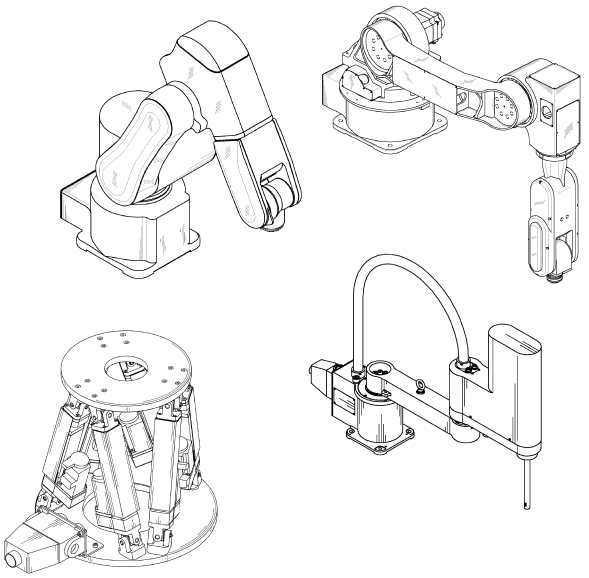 The company has also been granted several US design patents for their industrial robots (USD613781, USD629030, USD616909, USD616477, USD615574, USD625347, USD622299, USD642352, USD638455, USD651627, USD650820, USD670319, USD619632, USD642765), and even one for a teach pendant (USD644644). Of course, no one installs thousands of robots without the availability of technicians and engineers to operate them. According to a 2011 article, Foxconn has only recently selected 28 technical schools in China to provide training on their Foxbot. The Jincheng Senior Technical School’s Web site (page 1, page 2) describes the two-week training course taken by two of the School’s teachers on the Foxbot only a year ago. What was most surprising to me was the fact that some world-renowned university professors whom I know, employed by leading Chinese universities, know virtually nothing about the Foxbot. It seems to me, therefore, that Foxconn is not in too much of a hurry to find trained personnel to operate their robots. Personally, I am a bit disappointed in the Foxbot. I haven’t see a Foxbot design come out of this giant manufacturer that is original, in spite of their virtually limitless resources and six years of intensive R&D. In terms of the price of the robot, while comparatively low, it is hardly a deal. Interviewed for a recent China Daily article, one Chinese automation company executive doesn’t sound as if he is ready to buy a Foxbot just yet. In comparison, Universal Robots, a small 40-employee Danish company that sold its first industrial robot in 2009, shipped nearly 1,000 of its innovative robot arms in 2012. The company’s smaller arm costs about $28,000, but is much easier to program and manipulate than a conventional industrial robot. For a couple of thousands more, one can get DENSO’s superfast VS-series robot arm. It is sparklingly obvious that the Foxbot is years behind other robot brands. There is no doubt that the Chinese market for industrial robots will explode, and I am impressed with what some local companies like ESTUN Robotics have to offer. However, I don’t believe that we will see thousands of Foxbots flooding the Chinese market any time soon.